Heaven and Earth Animal Rescue Team is a nonprofit, all volunteer, limited admission pet rescue organization funded by private donations. We are committed to reducing the number of homeless and unwanted companion animals through education programs, spay and neuter programs, and the responsible re-homing of homeless and unwanted dogs and cats. HEART is a no-kill animal rescue organization and our goal is to find loving and permanent homes for the animals in our program and to match them with homes that are looking for that special pet, and will make them a member of the family. The health and welfare of the animals that come to us is paramount. All animals receive a medical evaluation, are fully vaccinated (if old enough) are spayed/neutered and any other health problems are resolved before adoption. 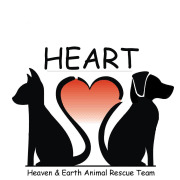 Would you recommend HEART Pet Rescue (HEAVEN AND EARTH ANIMAL RESCUE TEAM INC)?